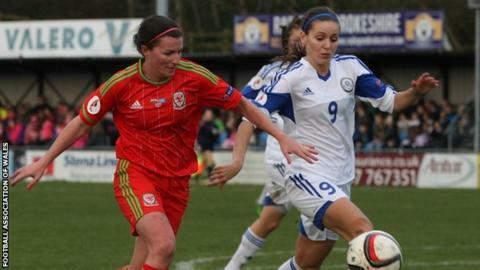 Wales' women's national football team have to wear men's shirts, striker Helen Ward has revealed. Ward, 29, said women's cut shirts are supplied for her club Reading but is disappointed the national women's side have to play in men's shirts. "We'll wear what we're given, but it is nice to be wearing a kit that fits and cut the right way," Ward told BBC Radio Wales. "It's really disappointing because a lot of shirts come in women's sizes." The Football Association of Wales have declined to comment. Ward was speaking after complaints by fans planning to go to the Euro 2016 tournament that replica shirts are not available in women's sizes. Ward is Wales' all-time leading goalscorer and has been included in Jayne Ludlow's squad for the Euro 2017 qualifier in Kazakhstan on 12 April. England's women team, who finished third at the 2015 Fifa World Cup, play in women's fitted shirts and Ward says Wales' women side deserve the same. "Most of us wear small men's shirts and sometimes if we're lucky we have extra large boys, which are a bit smaller. "It is what it is, and we play regardless and we are proud to play whatever size shirt we are given." Wales replica shirts for the European Championship finals in France, supplied by Adidas, were launched in November 2015 in men's and children's sizes. Ward believes an opportunity has been lost ahead of this summer's finals by not producing shirts for female supporters. "A lot of football shirts come in women's sizes now and not to have one for such a big occasion as the Euros is really disappointing," Ward said. "It's not just men and children who want to wear the kit, it's the women as well. "Everyone wants to go out wearing their colours but they want to go looking and feeling good." Kit suppliers Adidas issued a statement to BBC Wales. "The shirts on sale are retailed as adult shirts, intended for both male and female fans," the statement said. "There is not a women's fit specific garment available however the kits are of a tailored fit and a full size range is available to suit all fan requirements."